The 30 September 2018 was a disaster for the EU and NATO in the Balkans. At the time of writing, the state electoral commission expected the final turnout to be between 36 and 37 percent, significantly below the 50 percent required to make the result valid. Half an hour before the ballots closed, turnout had been just over 34 percent. With just over 80 percent counted, the result was over 90 percent of those voting being for the agreement. But no one could hide the disaster of the low turnout. The deal that Macedonian citizens were voting on – called the Prespa Agreement – had sought to change the country’s name to the Republic of North Macedonia, to placate official Greek government concerns that naming the country simply ‘Macedonia’ implied territorial ambitions on Greece. Now it is in question. Macedonia became independent after the dissolution of Yugoslavia in 1992. 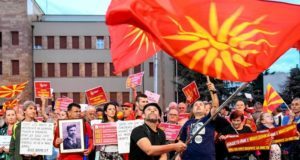 Since then, Athens has blocked Macedonia’s entry into various international organisations and forced it to call itself the Former Yugoslav Republic of Macedonia (FYROM). The latest twist still saw Macedonia having to make all the compromises: it had to accept it could not call itself what it wanted and it had to make a series of denials, like that it had any ties to the ancient Hellenic (Greek) Macedonia. This reflects a basic asymmetry of power. Not only is Greece a member of the EU and NATO, but its banks have consistently owned more than twenty percent of total banking sector assets in Macedonia. Greece is one of Macedonia’s most important trading partners, and dwarfs its neighbour with a population of almost eleven million compared with Macedonia’s just over two million. Moreover, it was clear that there was a basic interest in Western capitals to act to bring Macedonia behind the Euro-Atlantic shield in its escalating rivalry in Eastern Europe with its geopolitical foe, Russia. The fall of an increasingly pro-Russian and disliked Macedonian government in January 2016 served as a major opportunity to ensure Macedonia would decisively turn towards the West. The Western powers hoped to use the Tsipras government in Greece to help effect this shift in Macedonia. Despite being elected to defy them, Tsipras was desperately beholden to the Western powers after accepting to continue the austerity approach imposed by the so-called Troika of the European Commission, European Central Bank and International Monetary Fund to solve Greece’s debt crisis. Tsipras went far to convince the Western powers, especially the United States, that he was prepared to behave according to their wishes – he even ditched Greece’s relatively pro-Palestinian historical foreign policy and had Greece participate in joint military exercises with Israel, America’s watchdog in the Middle East. It was in this context that he and the new social democratic premier of Macedonia, Zoran Zaev, came to an apparent compromise deal which would stop the Greek veto on EU and NATO entry after Macedonia accepted to stop insisting to call itself simply the Republic of Macedonia. When Zaev called a referendum on the deal, he made clear that it was EU and NATO entry that were behind the bad compromise from the standpoint of Macedonia. That is evident from the question of the referendum. By making the referendum one about EU and NATO membership, both of which organisations had very high approval ratings in the run-up to the deal, Zaev made a calculated bet that the majority in Macedonia would overlook problems related to the name in favour of membership of the elite Western imperialist club. That Zaev was not acting in isolation was made clear when various Western dignitaries threw their lot behind his referendum. Leading European and US politicians, like German Chancellor Angela Merkel and the US Defence Secretary Jim Mattis, visited Macedonia to support Zaev. To underline their haste, in early September, NATO Secretary-General Jens Stoltenberg stated that the defence minister of Macedonia would sit at the NATO table from February of 2019 if the referendum was successful. Perhaps unsurprisingly, no major party in the Macedonian parliament mounted a campaign for a boycott. The ruling coalition of Social Democrats and Albanian national parties was in favour of a ‘yes’ vote, while the main opposition party, the centre-right VMRO-DPMNE, looked obviously divided and did not officially take a position. It was smaller parties that led separate boycott movements. Although several nationalist right parties took a prominent role in arguing for a boycott, the left wing Levica was also vocally for a boycott from internationalist positions and preventing the right from having a monopoly on the argument. It seems that these groups were more in tune with the feelings of the population than the Western powers and mainstream parties. For all the pressures on the population, the scale of the defeat of Zaev’s referendum could not be starker. It is a major setback for his government, the mainstream parties and the process of EU and NATO expansion. It is simply clear that the majority of people in Macedonia found the sheer extent of bullying and arrogant behaviour by their government and the West nothing short of revolting. It is moreover notable that the referendum did not just fail among Slav Macedonians, which had been projected in the opinion polls, but also among Albanians, who were polled as supporting the deal at a very high 88 percent. It must have become clear that, had the minority Albanian population been seen as tipping the balance, the situation could have returned to the civil war atmosphere of the fighting in 2001, when Macedonian nationalists in government led a campaign of violence against insurgent rebels among the Albanian population. Thus, a sense of popular unity prevailed on the day which showed local sensibilities saw further than domestic and Western elites, who were and continue to be prepared to play with fire, as they had done in Ukraine in 2014. Unfortunately, however, even after polls closed and the extent of the boycott of the referendum was obvious for all to see, Zaev declared the referendum a success and promised that Macedonia would nonetheless be a NATO and EU member. Seemingly oblivious to national sentiment, and representative of ruling class arrogance, the leader of a major Albanian party, the Democratic union of Albanians (DUI), also stated that his party had a mandate and would vote for EU and NATO membership in the parliament. Astonishingly, outside actors like Tsipras and Hahn encouraged Zaev to ignore the failure of the referendum, claiming that the result showed major support for the Prespa Agreement. The notion that the parliament should still endorse the deal shows the extent of the disconnect between the elites and the population. That opens up the door for a different logic for a movement of the left to emerge which could channel discontent in a direction of cooperation and solidarity among the different national groups, and against the ruling class. Levica’s stance during the referendum presents it with a major opportunity, and it will be incumbent on the left in the region and internationally to support and help it in this task. The alternative should it fail could be the renewal of near civil war conflict. Mass protests across Europe show that a .. Tensions in the Balkans: is Serbia prepa ..
Belgrade’s Municipal Elections: A Clas .. The Trump Effect in the Balkans: Serbia� .. The pain goes on: Greece and the Europea .. So the stakes are high, but they are not just high for Macedonia. The spirit behind the boycott in Macedonia reflects the gulf between the capitalist elites and the popular masses which is becoming evident across the globe in the twilight of neoliberal globalisation. In that sense, this referendum result was of course not the first time that the EU and NATO lost a referendum, and that the population revolted against the mainstream parties. From the Slovak boycott of the NATO referendum in 1997, through the French and Irish ‘no’ to the EU constitution in 2005, through to the Greek ‘OXI’ to the Troika in 2015 and the Brexit vote in the UK in 2016, the Macedonian referendum confirms a long-lasting popular rejection of the dominant order in Europe since the end of the Cold War. But the Macedonian referendum result comes in the context of the heightened global crisis in which the Western elites, despite mutual divisions over global strategies, are still desperate to continue to present onward expansion of the EU and NATO as unassailable and the sign of the inevitable onward march of liberal democracy under their leadership. Their continued failures in recent times are crowned by their inability to force a small nation in the Balkans in the direction in which they wanted it to go. That can only bring their legitimacy at home into question. Those forces of the left that refuse to prop up the institutions of the old order and are bold enough to see the world without the EU and NATO stand to benefit.